Impossible triangle was firstly painted in 1934 by swedish painter Oscar Reutersvärd. He drew his version of traingle as a set of cubes in parallel projection. Althow, many painters used impossible triangle in their art, Oscar Reutersvärd did open the fantastic world of impossible figures. He created thousands impossible figures for his life and now he is known as "father" of impossible figures. 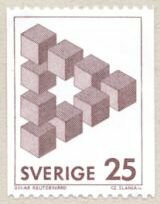 In 1980 Swedish goverment decided to place impossible triangle and two other his figures at postage stamps, which were printed about two years.. But the shape of impossible triangle is also well known as Penrose tribar. In 1954 english mathematician Roger Penrose after the lection of holland artist M.C. 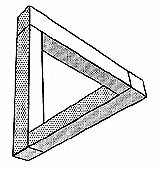 Escher drew impossible triangle in it's common view. Unlike Reutersvärd's triangle, he painted triangle as three bars connected with right angles. He gave perspective effect to it, which increased effect of impossibility. He published his version of triangle in British Psychology Magazine in 1954 in joined article of he and his father Lionel Penrose. 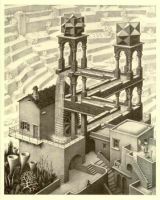 In 1954 Escher had not created his famous lithographs "Waterfall", "Ascending and Descending" and "Belvedere" yet. Note, neither Penrose nor Escher had not knew about artworks by Reutersvärd and Piranesi at that time. Penroses sent a copy of the article to Escher and in 1961 M.C. Escher created lithograph "Waterfall". Impossible triangle have been appeared many times in numerous artworks since that time. Many people think that impossible triangle is really impossible and it cannot be constructed in the real world. But it was proved that all impossible figures are possible. It's possible to create three-dimensional object that looks impossible from a single point of view and looks ordinary from all other points of view. You can read more about constructing of impossible figures in the artice "Impossible figures in the real world". The most impressive object 13-metres high sculpture of impossible triangle was created in Perth (Australia).